© Lattari et al. ; Licensee Bentham Open. Exercise produces potential influences on physical and mental capacity in patients with neuropsychiatric disorders, and can be made a viable form of therapy to treat Parkinson’s disease (PD). We report the chronic effects of a regular physical exercise protocol on cognitive and motor functions, functional capacity, and symptoms in an elderly PD patient without dementia. The patient participated of a program composed of proprioceptive, aerobic and flexibility exercises, during 1 hour, three days a week, for nine months. Patient used 600 mg of L-DOPA daily, and 1 hour prior to each exercise session. Assessment was conducted in three stages, 0-3, 3-6 and 6 to 9 months, using percentual variation to the scales Hoehn and Yahr, Mini-Mental State Examination (MMSE), Parkinson Activity Scale (PAS), Beck Depression Inventory (BDI), and Unified Parkinson's Disease Rating Scale (UPDRS-III). Reassessment showed clear changes in clinical parameters for Hoehn and Yahr (4 to 2.5), MMSE (14 to 22), PAS (13 to 29), BDI (9 to 7) and UPDRS-III (39 to 27) at the end of 9 months. According to our data, exercise seems to be effective in promoting the functional capacity and the maintenance of cognitive and motor functions of PD patients. Regular exercise protocols can be implemented as an adjunctive treatment for reducing the severity of PD. Keywords: Exercise, functional capacity, Parkinson’s disease, severity..
Parkinson's disease (PD), a chronic neurodegenerative disease, is manifested by a loss of dopaminergic neurons from the substantia nigra pars compacta, affecting up to 70% of these cells . PD prevalence is around 0.5-1% in people aged 65-69 years, increasing to 1-3% among individuals aged over 80 years . PD is associated with genetic, environmental, and behavioral features, resulting in the main symptoms, such as rigidity, postural instability, progressive bradykinesia, and tremor. These sensorimotor deficits are directly related to falls, reduction in functional independence and fatigue experienced by the patients . Currently available drugs for PD treatment just provide relief of symptoms and do not control or prevent the disease progression . Although many of these drugs are very promising, searching for new alternative treatments is essential. One such novel therapeutic option is physical exercise. Exercise might help by protecting against the disease as well as an adjunctive treatment, with proved benefits in terms of maintenance of functional capacity and quality of life . A meta-analysis published by Lima et al. showed that strength training improved the functional capability of walking and increased strength. Other meta-analysis found that exercise was beneficial for physical function, quality of life, strength, balance and gait . According to Falvo et al. , adaptive changes in neuromuscular functions due to strength training are very important because they are specific in PD patients, such as musculoskeletal weakness and are associated with negative changes elapsed by PD. Nevertheless, in a recent review  evidence in favor of exercise were found, however still inconclusive in relation to its efficacy on the promotion of quality of life and the reduction of motor and cognitive deficits. Additionally, the duration of the protocols applied in these studies were mainly shorter than three months, which raises questions about the benefits of regular, prolonged exercise for PD patients. We report the case of a 77-year old female patient, 8 years with PD and is currently in Hoehn and Yahr  stage 4, without dementia according to criteria established by Emre et al. . The patient engaged in a 1-hour exercise protocol comprising proprioceptive, flexibility and aerobic activities, 3 days per week, for 9 months. She was treated with 600 mg L-DOPA on a daily basis, as many before as during the 9-month exercise intervention, which at exercise days would be administered 1 hour before the start of the training session. Previously to the intervention, a moderate cognitive loss was detected by a score 14 in the Mini-Mental State Examination (MMSE) , as well as a moderate functional capacity, detected by a score 13 in the Parkinson Activity Scale (PAS) . A score 39 on the UPDRS III and a score of 9 was observed in BDI. 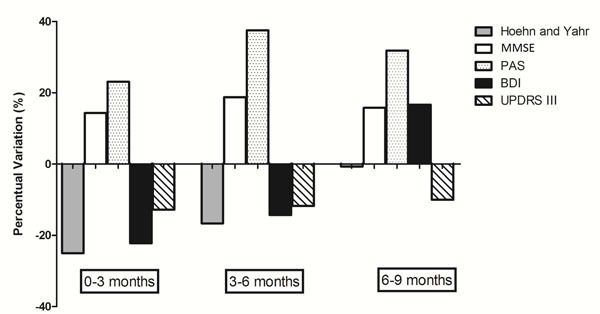 Data from the re-evaluations conducted during the chronic exercise intervention show a clear reduction in the severity of the disease by the end of the 9-month period according to percentual variation (Fig. 1). Percentual variation of disease evolution throughout exercise intervention. Note: BDI: Beck Depression Inventory; MMSE: Mini Mental State Examination; PAS: Parkinson Activity Scale; UPDRS: Unified Parkinson's Disease Rating Scale. It is well known that PD is associated with a number of motor and cognitive deficits [5,9]. Exercise seems to contribute to the protection of the central nervous system (CNS) against PD, and can be considered as an adjuvant treatment approach to the disease . Also, epidemiological studies suggest that exercise reduce the risk for PD [5,9]. Additionally, other studies have been investigating the efficacy of exercise on PD, especially in terms of motor performance, gait and activities of daily living . Thus, variables such as exercise intensity seem to positively modulate the neuroprotective effect, since more intense activities would be more strongly associated with the induction of neuroprotection . These studies showed that exercise is effective in the promotion of the quality of life and in the maintenance of motor and cognitive functions [5,9]. In fact, the enhancement of functional capacity, as consequence of strength , proprioceptive and flexibility training , may positively affect patients’ functionality and quality of life, which is not necessarily due to neurochemical alterations . In terms of cognition, it is known that exercise increases the synthesis and release of various neurotrophic factors, such as brain-derived neurotrophic factor (BDNF) and insulin-like growth factor (IGF-1), both of them are related to healthy cognitive functioning, neurogenesis and cerebral plasticity [5,9]. Although there are few studies showing that exercise in long term appears to be beneficial for PD patients [5,9], our results support the few evidences that have been published, especially in terms of cognition. Poewe W, Mahlknecht P. The clinical progression of Parkinson's disease. Parkinsonism Relat Disord 2009; 15 (Suppl 4 ): S28-32. Gazibara T, Pekmezovic T, Tepavcevic DK , et al. Circumstances of falls and fall-related injuries among patients with Parkinson's disease in an outpatient setting. Geriatr Nurs 2014; 35(5): 364-9. Tarazi FI, Sahli ZT, Wolny M, Mousa SA. Emerging therapies for Parkinson's disease From bench to bedside. Pharmacol Ther 2014; 144(2): 123-33. Matta MPE Cevada T, Sobral MR , et al. Neuroscience of exercise from neurobiology mechanisms to mental health. Neuropsychobiol 2013; 68(1 ): 1-14. Lima LO, Scianni A, Rodrigues-de-Paula F. Progressive resistance exercise improves strength and physical performance in people with mild to moderate Parkinson's disease a systematic review. J Physiother 2013; 59(1 ): 7-13. Goodwin VA, Richards SH, Taylor RS, Taylor AH, Campbell JL. The effectiveness of exercise interventions for people with Parkinson's disease a systematic review and meta-analysis. Mov Disord 2008; 23(5): 631-40. Falvo MJ, Schilling BK, Earhart GM. Parkinson's disease and resistive exercise rationale, review, and recommendations. Mov Disord 2008; 23(1): 1-11. Murray DK, Sacheli MA, Eng JJ, Stoessl AJ. The effects of exercise on cognition in Parkinson's disease a systematic review. Transl Neurodegener 2014; 3(1): 5. Goetz CG, Poewe W, Rascol O , et al. Movement Disorder Society Task Force report on the Hoehn and Yahr staging scale status and recommendations. Mov Disord 2004; 19(9): 1020-8. Emre M, Aarsland D, Brown R , et al. Clinical diagnostic criteria for dementia associated with Parkinson's disease. Mov Disord 2007; 22(12): 1689-707. Folstein MF, Folstein SE, McHugh PR. "Mini-mental state".A practical method for grading the cognitive state of patients for the clinician. J Psychiatr Res 1975; 12(3): 189-98. Nieuwboer A, De Weerdt W, Dom R, Bogaerts K, Nuyens G. Development of an activity scale for individuals with advanced Parkinson disease reliability and "on-off" variability. Phys Ther 2000; 80(11): 1087-96.